The DS9092T# iButton probe provides the electrical contact necessary for the transfer of data to and from the DS19xx family of iButtons. 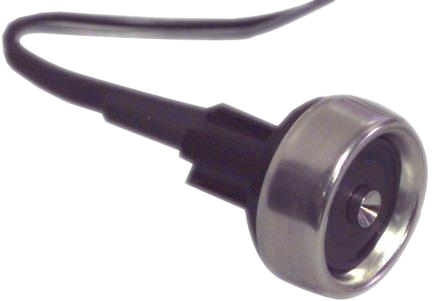 The round probe shape provides a self-aligning interface which readily matches the circular rim of the iButton's MicroCan package. Metal contacts resist wear and are easy to keep clean. The DS9092T# tactile feedback probe is ideal for situations where the iButton is stationary and the movable reader is brought in contact with it. It comes in a panel-mount version which is fastened behind the panel with a push-on type spring-nut. The two 15cm 22AWG wires are provided for easy connection to the system microcontroller.